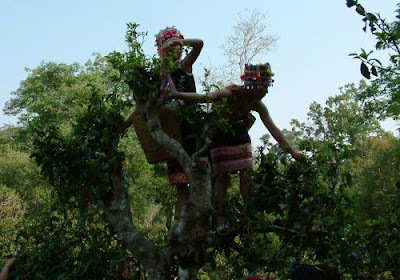 Roy passed along this great photo of picking puerh tea from an old, wild tree in Yunnan. The best puerh grows in areas mainly populated by some of Yunnan's many ethnic minorities; these girls are dressed in the traditional fashion of one such group. Apropos of the "single bush" argument, not even a tree of this size can produce enough tea to make up an individual batch. But in any case, we thought you'd enjoy this fascinating look inside the process of creating the delightful beverage we all enjoy in the cup.